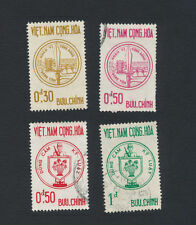 Vietnam Stamps. 46 Various Singles. Never Hinged. Vietnam 35 various Stamps. LH/MH. Vietnam, Sc.#1060, HCM in 1924, black offset on back. NGAI mint. South Central Vietnam-LKV, 1954, GENUINE HCM portrait stamp, Michel #7, used. VERY COMMON FOR THIS ISSUE. THIS IS THE WAY THERE WERE COLLECTED IN THE 1990'S BY THI PERSON OF THIS ESTATE. THIS IS THE BEGINNING OF A LONG PROCESS OF LIQUIDATING A VERY LARGE EXTENSIVE STAMP COLLECTION. South Vietnam, Sc.#J8 & J10, Postage Due 3pi & 10pi, imperf. block of 10. MNH. South Vietnam, Sc.#166-169, Saigon-BienHoa Highway set of 4. imperforatyed. MNH. SOUTH VIETNAM, Sc. # 166-169, Saigon-Bien Hoa Highway set of 4, imperforated, MNH. Scroll down and hit the blue button when. The item in the photo is the exact item you will receive. COMMIT TO BUY & SUMMIT REQUEST. Ready to send request for new invoice with. When you are done adding, hit this button. South Vietnam, 1975, UNISSUES Year of the Dragon set of 2, per+imperf+S/S. MNH. SOUTH VIETNAM, 1975, UNISSUES Year of the Dragon set of 2, perforated imperforated S/S. A Couple Of Harder Ones To Find. Front Cover w/ Hai-Phong P.M. 1952. N.Vietnam 1971 - Statues from Tay Phuong Pagoda - VF, MNH. COMMIT TO BUY & SUMMIT REQUEST. Ready to send request for new invoice with. Scroll down and hit the blue button when. How to get the invoice when you buy more than one item When you are done adding, hit this button. Beside that, for safe, I will put the stamp between two pieces of cardboard and send it in an envelope when you buy it! So, set your mind at rest about quality! You get what you see in the picture ( V146 ). It is impossible for us to detail check every stamp in a Collection, unless it is described by the source as Used, Mint Hinged, Mint Never Hinged(UMM/MNH), etc. Rest of the World: £3. GOOD QUALITY! COMBINATION OF MORE THAN 1 LOT POSSIBLE! North Vletnam-LKV, Ho Chi Minh portrait 50d/15d, fantasy print. NGAI mint. NORTH VIETNAM - LKV, Ho Chi Minh portrait 50d/15d, fantasy print, good for study. NGAI mint. 9, 66916 Breitenbach, Germany. Hinweis gem.